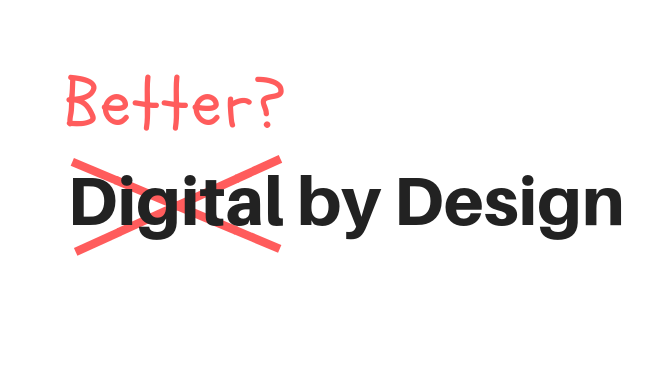 When you hear the name ‘Digital by Design’ what do you think of? New technology or computer systems probably comes to mind. When we first started the project over 3 years ago the name seemed very apt. The word ‘design’ helped us focus on creating something new that worked in a set way because that was how we had envisioned and planned it to be rather than something that happened by chance. The word ‘digital’ was apt too because our focus was on improving the council’s digital offer – primarily our websites and how well we could integrate our systems. When we start work with a new service area they often think at first that ‘digital’ is about building some new tech or digitising an existing process. This couldn’t actually be further from the truth. Our teams don’t start with the technical solution. In fact, we don’t start with a solution at all. We start with the problem. We take time to work with the service to understand together what the root cause of the problem is – this means understanding user need, understanding processes and systems and the vision that the service has for how they’d like to operate in the future. Understanding this from all perspectives is essentially service design. If a technical solution is required we’ll build it but if not we don’t reach for it as a panacea. Sometimes we can achieve equally amazing results by not actually ‘delivering’ anything but by changing a process, for example. Service design isn’t as tangible as a new piece of equipment or a mechanical knight on a robotic white horse. So by keeping the name ‘Digital by Design’ aren’t we just setting ourselves up to disappoint if a technical solution isn’t required? Increasingly our challenge isn’t just about delivering technical change or redesigning services. It’s about moving the mindset and helping all areas of the council see that creating successful modern services are about so much more than just the online elements. Our aim is to make things better by design. There is a further problem with the name Digital by Design. It implies that by having a specialist ‘digital’ team, that creating digital services is the preserve of this select team of people. True, we do have a great bunch of people who have some great skills, but it is something we can and should share. And let’s be honest if we accept that the council needs to constantly evolve this is something we all need to get better at doing. While transforming areas the project team needs to be careful that we don’t create a dependency. We have always been mindful that we need to work with the service and not for them. So we’ve been open about how we work, have encouraged two-way feedback and have shared learning where asked. We now need to go beyond this and make it a core principle that we do more to empower service areas so that they can do some of this for themselves. So they can gain a deeper understanding of their own operating models, the processes they have in place, what their users experience, what their users need, what their service costs, how well it performs and crucially, what’s coming next? If they’re not happy with what they see then with support, these things should be in their gift to change. Service design is a skillset, but it’s also a mindset. Whilst many of the techniques we use need some degree of specialist skill, many can be easily learned and applied universally if there is the desire to try. We’ve just started working with FutureGov to help us achieve this ambition and as the programme manager for the next phase of work I recognise and welcome this challenge and look forward to this next step in our journey. We will be sharing this in future blogs as our work progresses.